Our Medical Director, Dr. Alexander Goldberg, M.D., is an American Board certified physician who is fully devoted to your medical and wellness needs for over 20 years. His patients are children, adolescents, adults and the elderly. He believes in a holistic approach to wellness and medicine as a strong foundation to physical, mental and emotional health. Dr. Goldberg is supported by our medical team, which consists of expert medical professionals; some of them have been with the practice for 10 years. 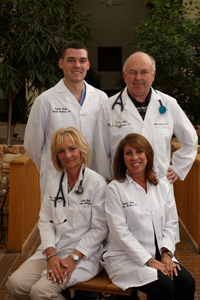 We work closely together, like a family, as we strive to serve you as if you were our only patient. Taylors Mills Family Medical Center is more than a family practice. Our extensive education and hundreds of thousands of cases in disease prevention prompt us to extend our practice to longevity, anti-aging and wellness as a natural way to help you stay healthy and live a longer, happier life. Our ability to recognize and partner with specialist physicians and other medical professionals in the area to refer you to our most trusted specialist’s physicians and support medical groups. Dr. Goldberg’s diverse background in medicine. His achievements are consistently recognized not only by the American Board of Family Physicians, but also internationally, going back to his years of practice in Russia and Ukraine when he was practicing medicine as an emergency and abdominal surgeon of the highest grade. His unique talent as a surgeon became his major asset as a diagnostician when he decided to dedicate himself to Family Medicine in the United States. If you need an accurate diagnosis, you can rest assured that he will give you all his attention and profound knowledge. To read more about Dr. Goldberg, please click here. We follow the latest medical research, procedures and techniques as we attend numerous conferences and seminars and share our knowledge with you and your families. We want all of our patients to be healthy and limit their visits as much as possible. But if you or your loved ones are admitted to Centra State Medical Center, Dr. Alexander Goldberg will personally see you there as an attending physician. Taylors Mills Family Medical Center and AgeLess Solutions are proud to maintain long term relationships with our patients since they refer us to their families and friends. Since your needs are the most important to us, we provide flexible appointment scheduling and walk-ins. If you need to schedule a same-day appointment; our staff will most certainly try to accommodate you. Our office is open late on Mondays. We also have Saturday hours. Dr. Goldberg has been practicing medicine in Monmouth, Somerset, Ocean and Atlantic Counties of New Jersey for the last 13 years and he is affiliated with the following hospitals and healthcare facilities: Centra State Hospital, Freehold, New Jersey; Bartley Healthcare and Rehabilitation, Jackson, New Jersey. Doctor Goldberg is an active member of the American Academy of Family Physicians.